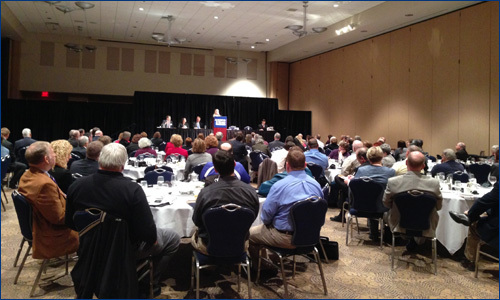 Andrews and Beard held its third Education Law Symposium on March 20th at the Blair County Convention Center in Altoona. More than 140 school administrators and board members attended the event. The Symposium featured presentations by Firm attorneys on topics of importance to Educators today. Firm attorneys spoke on: Collective Bargaining and Labor Relations, Education Law updates, Executive Sessions and Right to Know, Challenges to School District Policies and How to Defend Them, and Tax Assessment Appeals. Special guest speaker Sara J. Rose, staff attorney for the American Civil Liberties Union, Pittsburgh office, also addressed issues of importance to the ACLU and what the ACLU sees currently. The evening began with a reception, included dinner, and culminated in the seminar presentations. There was also an opportunity to ask specific questions and share information.